Nathan loves to go swimming. Even if it’s in a tiny little splash pool. 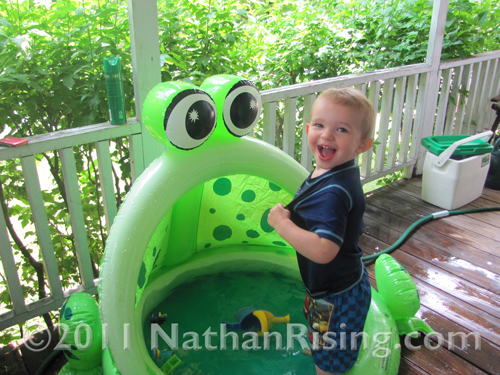 Funny thing is that he doesn’t even completely sit down in it… he mostly stands up and splashes around. It’s so cute to watch! Funny story for you. 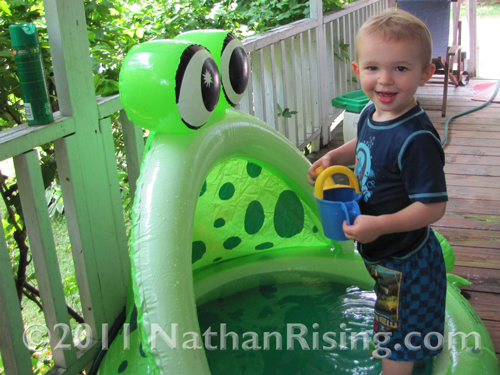 Once, when it was Really Hot Outside, Nathan was playing in his little splash pool. The water he was splashing in looked positively tantalizing. I had on my bathing suit anyway (due to the heat) so I decided why not? I got into Nathan’s little splash pool with him.